Conveniently compact in size, the Sharp LC-24CHF4011K is stylish and versatile. Enjoy a range of entertainment options in 1 simple setup thanks to the built-in Freeview HD and USB multimedia player. What’s more, a variety of connection options makes it easy to connect additional entertainment devices. 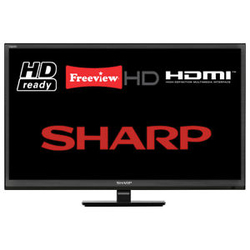 The small 24-inch TV screen is HD-ready and features LED technology. Producing a vividly clear and vibrant picture, the LED TV delivers entertainment in excellent quality.